So I am going to give a bit of context with this figure review. Firstly, I love X-Plus products. I think it was probably 2014 when I got my first, and while I do like to build a good kaiju model, the availability of a product that provided superb detail at a great price with far less faff was indeed a Revelation to someone who had been searching for hard to find custom resin kits. 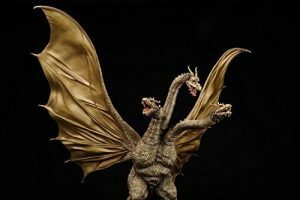 Now that we have that bit out of the way, let’s travel back to 2014 when X-Plus released the Large Monster Series (25 cm scale line) 1968 Ghidorah. 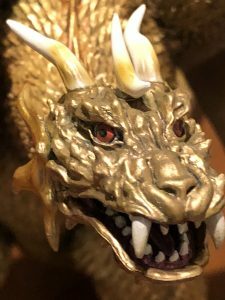 Having just gotten my first figures; a Varan and 1989 Godzilla in 30 cm scale, dishing out the $400ish amount of cash to get that bad boy was more than I was willing to shell out. That said, it was and continues to be such a gorgeous figure. The Large Monster Series 1968 Ghidorah has an iconic pose. The amount of detail that the ’68 figure has is simply incredible. Check out the teeth and scales on this thing! I quickly felt a bit justified in not pulling the trigger. As the deliveries started to come in, many collectors were having issues with Ghidorah arriving in one piece. Snapped horns, broken necks etc seemed a bit too common place. I mean, not that I could afford that figure anyway, but as terrible as other collectors’ misfortunes were, they made me feel a bit better being left out. After all, no item in my entire collection of geeky artefacts was worth so much. A year or two later, Bluefin distribution in the USA offered another release on the figure, but I passed up on it again. It was still quite expensive, and I was quite happily collecting the 30 cm figures of my favourite monsters that Diamond was still releasing. …but then X-Plus threw a curve ball in the works and released the Shin Godzilla figures in 25cm, 30cm, and Gigantic scales. That was me done for a long while as there was no way I was passing on any of those. But in the background….X-Plus released the the 2001 Ghidorah in the spring of 2017. Probably one of the strongest releases X-Plus has ever had – regardless of line. I will say that although Titanosaurus is my favourite non-Godzilla Toho monster, Ghidorah is a close second. I will also say that Ghidorah is the most iconic villain Godzilla has in his rouges gallery. However…good-guy-Ghidorah was a next level concept for me. In the 90’s film Godzilla vs King Ghidorah, a humanity allied Mecha King Ghidorah was a fantastic surprise, and then in 2001 a guardian monster Ghidorah came to be. 2001 Ghidorah steals the show in Godzilla, Mothra, King Ghidorah: Giant Monsters All Out Attack (aka GMK) – and yes I do realise that there are probably Godzilla, Baragon, and Mothra fans out there that may argue the point, but let’s be honest he is the most dynamic Ghidorah there is. 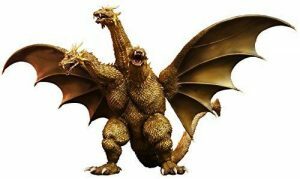 As unlike every Ghidorah that came before him he could fold his wings, burrow underground, and once he did wake up and really enter the brawl – he fought on land see and sky! To see a snippet of the film click here. 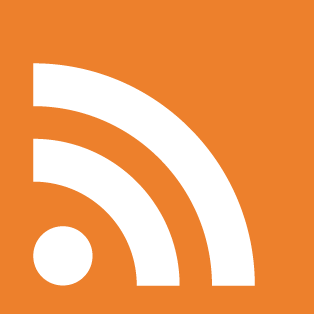 So anyway – lets get on with this review! Now, upon opening this figure the first thing that I noticed was that the gaudy gold colour you see in all the pictures online is not at all what colour the figure actually is, at least for the standard version which is the way I went. If I had gone with the RIC limited special edition, he could very well have turned up a glittery gold. This is because the RIC version is supposed to represent the “1000 year old dragon” version of Ghidorah in the movie. Different from the standard golden colour I was expecting, the figure instead is a rich golden brown with amber highlights. The second thing I immediately noticed was the exquisite detail all over the figure. Every single scale – each and every one – is individually sculpted and was highlighted during the painting process. This makes the figure truly “pop” when viewed up close . Seriously! 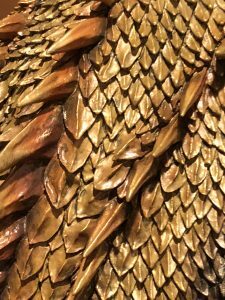 Just take a look at how much effort went into those scales! The ridges going down the centre of each one as well as the brown, amber and gold highlights. Perhaps the most beautiful scale highlights are those that can be seen along the figure’s back, running along Ghidorah’s spinal column. These larger spines are a continuation of the spikes that run along the crest of each of his three necks. They grow larger as they run down the slope of his back before parting again to run along the tops of the two tails. 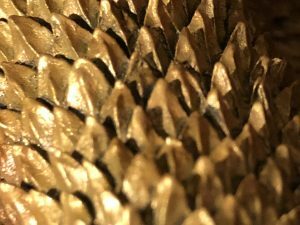 This picture gives a good look at how this Ghidorah has distinct individually sculpted scales that give him a more realistic, more natural, skin texture. Obviously more special effects artistry could be afforded in 2001 than in 1968, especially since the suit in 1968 was already a veteran. This is probably the reasoning behind why the 2001 figure has so much more added detail than the 68 version – simply because the technology and industry behind the creation of special effects had progressed so far. To continue along the line of extra added detail, the claws on the figure have fantastic texturing, and colour blending, and X-Plus also went the extra mile to gloss them as well. This gives the claws on the feet, for example, an ivory look to them. This is why I buy X-Plus figures, they really are top of the line in quality. The heads on the figure all have different expressions and the necks that hold them all are flexing in different directs and arcs. 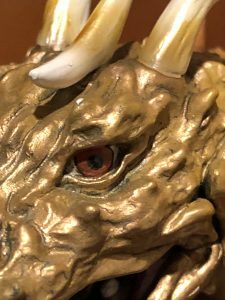 One of the really neat details about the heads that many GMK fans may already be aware of is that the Showa Fuzz or the Heisei spiralling spikes have been replaced on either side of each head with a trio of fleshy spikes. These are present because via an artistic nod to the monster Varan, which along with Anguirus was dropped in favour of Ghidorah and Mothra respectively. Of the three heads I think I enjoy the facial expression of this one the most. It is almost like his mother is telling him to smile in a forced family photograph. The eyes are reproduced exquisitely in this figure. Also, take note of the subtle shading around the face so that it doesn’t just appear as a uniform gold. The heads themselves are just full of detail. The eyes have been painted, and naturally they have been glossed. I watched the film prior to writing this review and truly, with the right lighting effects I probably wouldn’t be able to tell the difference between the actual film prop and the X-Plus figure. The teeth are all also individually sculpted, and painted. 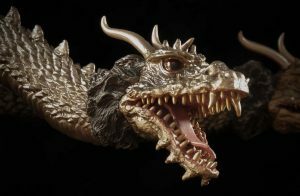 Again to call out another detail that sets this release above that of the 1968, this Ghidorah has molars, and fangs. Sculpting different types of teeth in these mouths, is again something that breaks up the traditional uniformity. Check out those chompers! The fang is quite present, but in the back you can also see the molars. 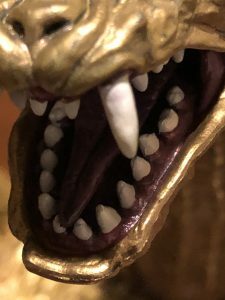 The teeth (look at those in the lower jaw) are all individually sculpted and reflect a life of battle for this guardian kaiju. 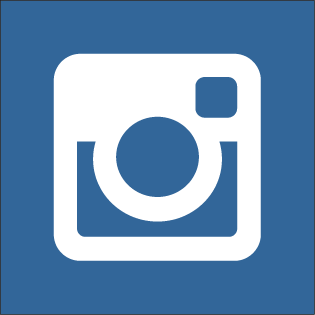 If you have looked at other reviews for this figure, you may read or notice that some reviewers tend to do a section on seams and drawbacks that the figure may have. I am so in love with it, I cannot really find a fault with it. 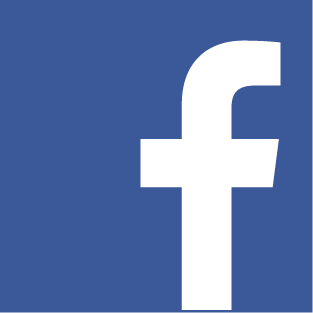 It is a figure, it has some small seams, areas where you can tell it was painted by a human hand…but these are quibbles when looking at the overall quality of what is being presented. I will however go over one seam on the figure, which to my knowledge is pretty unique among the X-Plus lines. 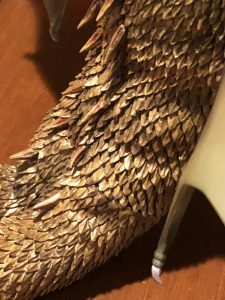 This is the seam, or connection between the body and the tail. It is also the only connection, or assembly required for the figure as the wings do come, and are meant to stay attached. There’s supposed to be a seam some where in there but I’ll be darned if I can see it! The tail, rather than using the typical vinyl figure male and female ends, instead has a magnet to keep it in place. Honestly I think that it does an amazing job, and that it is actually an improvement over the standard style. My reasoning for this is because regular vinyl warps, and stretches over time. A magnet by contrast is a magnet and it is not going to loose its charge any time soon. So the likelihood that this figure will suffer from a sagging hinge or other age or heat related ailment is very unlikely. So there you have it. An incredibly solid release from X-Plus if you ask my opinion. All of the detail is spot on, the pose is classic Ghidorah, and the paint job is much more dynamic than the promotional photos let on. I am personally very interested in what X-Plus has in store down the road for this iconic monster as both the third instalment of the Godzilla anime and Godzilla: King of the Monsters are being released in 2019, and if history is something to go by, the X-Plus studio typically times the releases with the films. We have also yet to see Grand, Cretaceous, Heisei, and Mecha Ghidorahs which have been getting requests. 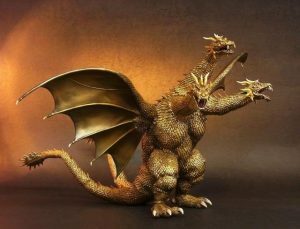 However, what we are getting in 2018 is a large monster series Monster X which is meant to be paired with the Kaiser Ghidorah which has already been released. The promotional picture from X-Plus. 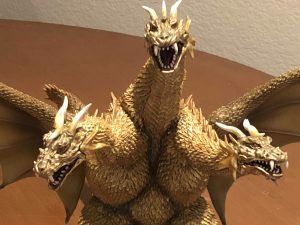 Sufficient to say there is a lot of Ghidorah on the horizon, but the monster’s popularity, and the quality of this figure have already made it hard to find. 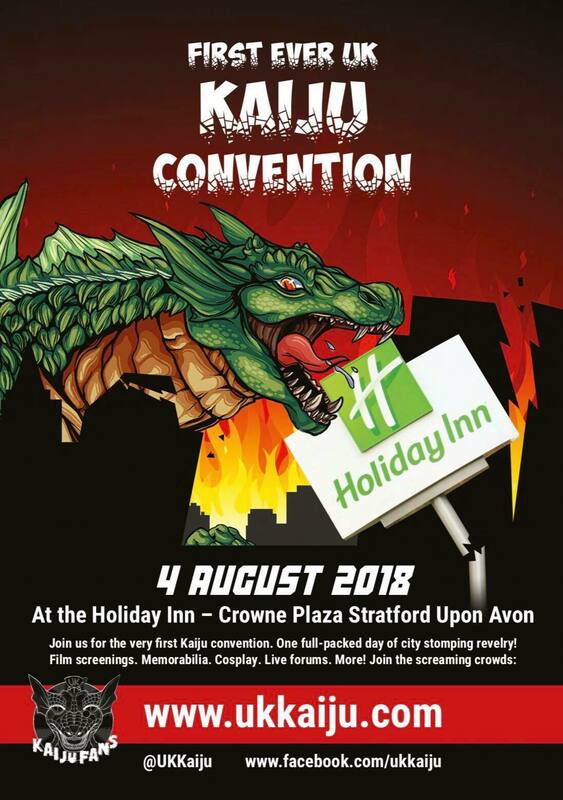 What I recommend at the time of writing this review are sites like Manadrake and Yahoo Japan – Manadrake being the stronger recommendation as it is more in line with the kaiju loving market. That about wraps it up for me this time kaiju fans. I hope you enjoyed this review, and if you have this figure give a shout out in the comments what your favourite aspect of it is! What a fantastic looking model, those scales are beautiful. Can’t wait to see the what designs and models 2019 brings us.